While floods can cause major destruction, the damage caused by floods IS NOT covered by basic homeowners insurance. That’s why Standard Insurance Agency offers flood insurance through the National Flood Insurance Program. This special policy provides the specific coverage you need to help protect your home from the devastation of a flood. Get the protection you need at a price you can afford. 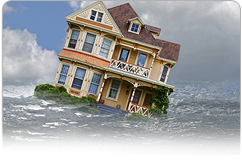 Call or request a quote for Flood Insurance from Standard Insurance Agency today. Be ready! Visit the Federal Emergency Management Agency website for more information on preparing for floods.